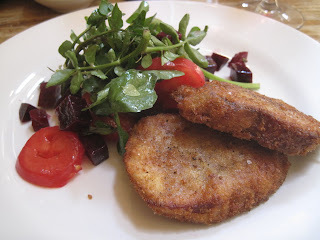 If Gastropubs were like football teams The Anglesea Arms was once at the top its game. Back in the day (sorry) when the Gastropub was quite a rare bird indeed and it was seen as a means of producing good, uncomplicated food in casual surroundings and not as a delivery mechanism for hosing punters with massively marked up, pre-cooked food, The Anglesea Arms was generally acknowledged as the Head Honcho, the Chairman of The Board, the Big Cheese, if you will. Places like The Eagle and The Peasant may have been around longer but the queues at the weekend attested to the fact that the cooking at this Hammersmith favourite was a bit special. Then something happened. AA went dark. I heard a rumour saying it was closed. Then HS told me it had got a new chef and apparently was worth trying out again, after all these years. 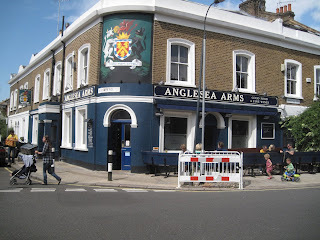 The Anglesea Arms is situated in a pleasant little area dubbed Brackenbury Village by the estate agents. This is usually a euphemism for a sketchy area that doesn’t have a tree that’s not been vandalised or a postbox free of dangerous graffiti. In this case though the attribution seems apt. 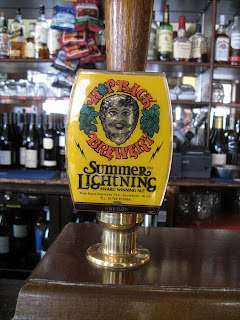 Sitting in a pub cooled by larges fans and cradling a pint of Summer Lightning, the rather grim environs of Shepherds Bush (I can’t believe it’s exactly as I left it twenty years ago) and Hammersmith seemed far away. There’s no booking here, which back in the 90’s might been a problem for the reservation-phobic DH. But now, on a sunny Saturday, people were arriving, sleepy-eyed, in dribs and drabs which meant nabbing a table wasn’t an issue. I must admit that Summer Menus don’t get me er, tumid, nevertheless the reasonably-priced menu did have a few things that looked worth a punt although another type of fish (or in addition) wouldn’t have hurt. 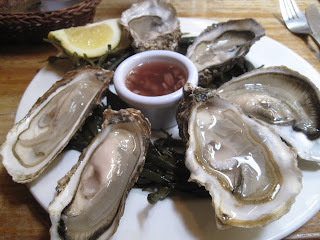 Six Irish Rock Oysters were good and fresh although they were spawning. Not to the extent of those I had at Racine and not enough to mute the briny taste. It made me wonder though whether a) kitchens recognise this and b) if they do whether they send them out anyway. Just a thought. 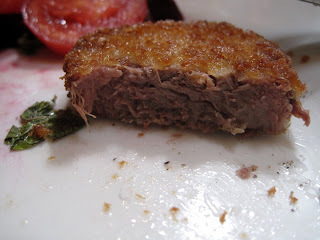 Tongue had been cooked, coated in breadcrumbs and fried. The two large discs needed more salt but were still good and meaty. The little salad on the side didn’t really come together although the Tomatoes were excellent and the Marjoram was a nice touch. Some Sauce Gribiche would have been perfect here. 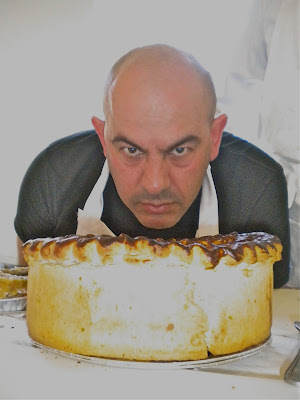 I have the feeling that the Head Chef at The Anglesea runs a tight ship. 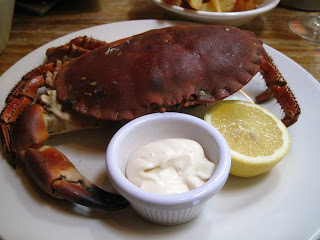 A request for a bowl of Chips with my Crab necessitated a little conflab in the kitchen before the nice lady serving me said “The kitchen only has a limited portions [of chips]…but you can have some”. The person who requested some after me wasn’t so lucky. They turned out pretty good though. It seemed like they actually were “Hand Cut” and while not triple-cooked still had a crisp exterior and fluffy insides. A bit like me really. With the Chips a dressed Crab provided plenty of messy fun. 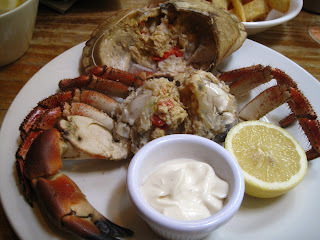 Retrieving smooth, intense, pate-like brown meat and sweet delicate white claw meat was followed by lots of cracking and sucking of exoskeleton and poking of fingers into various Crab orifices to get full value for the £12 price. Apologies to any neighbouring tables witnessing all this. 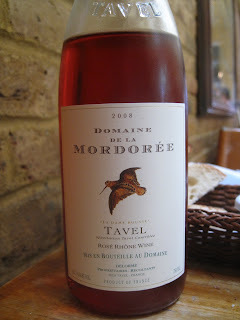 A Tavel Rose from Domaine De La Mordoree was good gear and went very well with everything although at a stonking 13.5% it belied the reputation of Rose as a light, gluggable Summer drink and had me walking a couple of inches off the ground as I left. After chancing my arm with the chips finessing my pudding didn’t seem like a good idea. 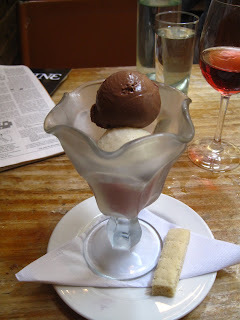 These days the Ice Cream ante has been upped and kitchens with any sort of rep all make their own. The stuff here was fine in taste although the texture too soft and smooth. 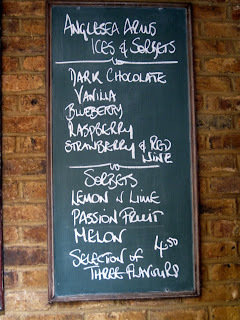 For me The Bull & Last’s Ice Cream remains a standard. 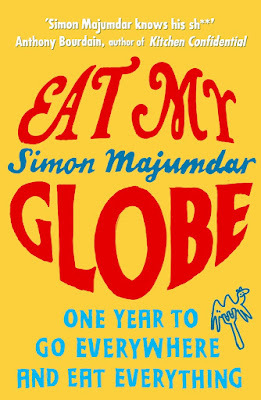 Summer’s not a good time to really put a kitchen through it’s paces and it would be worth returning here later in the year, Autumn say, when more interesting stuff comes onto the menu. 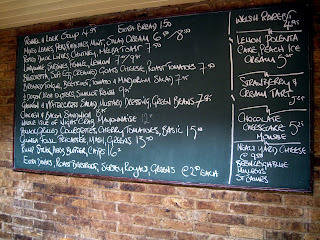 For now The Anglesea Arms remains a decent choice for a long relaxed lunch. 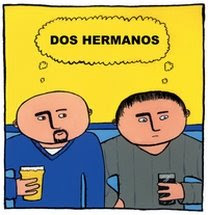 If Gastropubs were like football teams The Anglesea Arms would be…Arsenal. I don't why they would do that to cheese. It was upsetting. As a local resident and regular visitor to the Anglesea, I can safely say that it's consistently marvellous, in execution, in service and in atmosphere. Not sure when this 'blip' of yours occurred, but no other gastropub of my ken manages to fulfill both its functions (boozer & eaterie)with such even-handedness. Anyway, carry on and keep up the good work! we ate here a few months ago and thought it had lost its edge from the time before that. The main memory is of slightly sticky table mats and a charming waitress who offered to give us all hair cuts- I can't quite remember why. I once came for a long and boozy dinner here. When we were leaving and they were closing, I threw some ice at my mate and was chided by the manager: "You've only let yourself down". 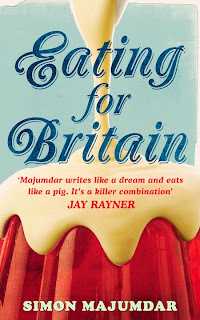 This is when I really knew that I don't belong in West London. 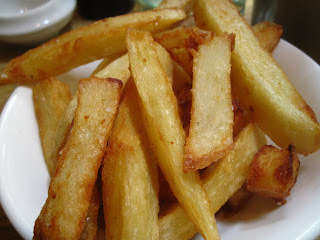 Well I didn't really test the kitchen as you can see but the chips were good which counts for a lot in my book. OK,I will rise to the bait. my friend said you have used a sybelline turn of phrase(in the Arsenal comparison) designed to cause endless speculation.